This became Jan´s last cultural historical book project. The second edition of this book was printed in August of 2017. The thoughts about this book came six years ago. When Jan Helling wrote his cultural historiacal book "Närketrilogin". He found his relative Christina, his grandfathers aunt. She lived from year 1820 to 1903. Her first 47 years in the province of Närke in Sweden and her last 36 years on Nerike Hill in Wisconsin. She was a very interesting person who became a very knowledgeabel and energetic woman for her lifetime. This book is in Swedish and end by the time of her emiration to North America 1867. You will find all chapters by chapters translated into English under tab "CHRISTINA". Hopefully American relatives will later produce a book telling more about Christina´s and other immigrants life in Wisconsin and Minnesota. Jan made his first trip to the USA1978. At this time he had the opportunity to meet with several of his American relatives. During making preparations for this trip he became aware of the importance of having access to a family archive. He was lucky to have family records that his father Hjalmar Helling had organized. He had a wish that his son should take care of this archive and communications with relatives after him. 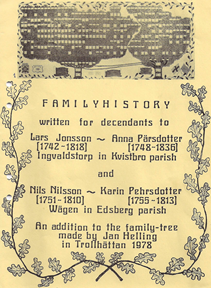 Jan gathered new information and created 1978 both a family tree and a simple family history. ​Since then he has typically at every Christmas time replenished the family archive with new facts received by cards and letters from relatives near and far away. Nowadays this archive is digitalized in a special program. If You have a similar program you can ask for a Gedcom file from Jan to import into your program. If you have a program and are able to export a Gedcom file, he will be happy to use it for upgrading our own records. Notice that this file is rather large. Jan has since long had a personal interest in Cultural History. Besides books for business, he has also written some books for his family. Among these books are some narratives with our relatives as leading actors. All these books are written in Swedish. 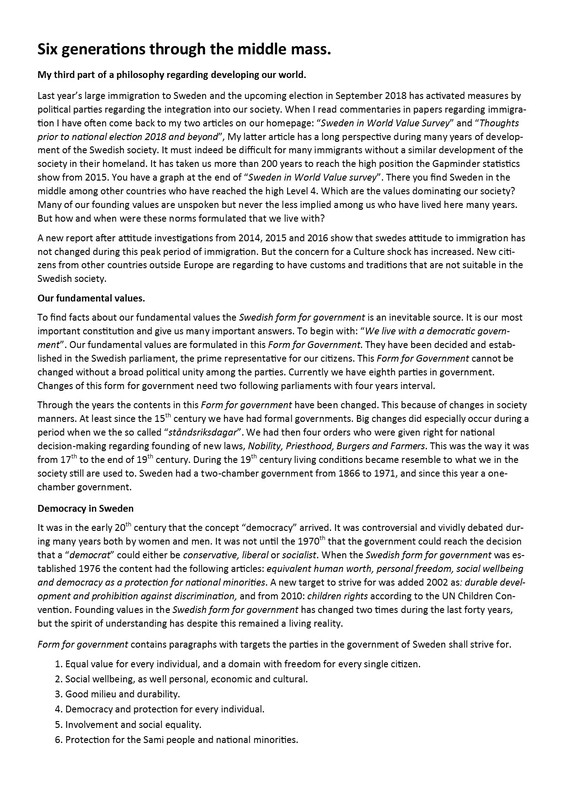 During 2010 Jan spent much time fact-finding regarding our roots in the province of Närke in Sweden. At the end of the year he had written a new book with the title "Närketrilogin". This story is about three generations of ancestors and it ends with three related families emigrating from the province of Närke in Sweden. They did colonizing and settling down on Nerike Hill in Wisconsin. They were among the first immigrants settling down in this area in Wisonsin. 2) at the Minnesota Genealogical Society in South St. Paul on Concord Avenue. To make it more easy for his children and grandchildren to consume this part of our family history he have made a summary of the content of the book in a PowerPoint presentation. 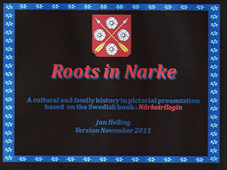 He have also made a version with text in English with the title "Roots in Narke". You may be able to download this presentation if you have an Adobe Reader in your computer. During 2014 and 2015 Jan spent much time fact-finding for his next cultural historical book. I has the name:"Trådar som försvann", and is written in Swedish (title in English should be: "Treads that disappeared"). 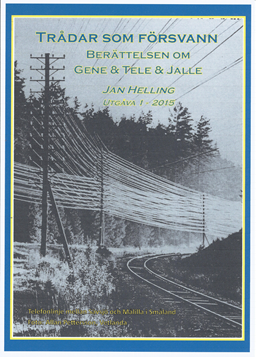 This book has three intertvinned threads - about Jans father (Jalle), the telecom development i Sweden, that he work with all his working life (Tele) and the never ending story of genes and dna throughout generations of family history (Gene). Jan´s last book about the life of our relatives was written in 2017. It has the title "Min syster Christina", and is written in Swedish. This book end when Christina (The aunt of Jans grandfather) emirated to North America in 1867. The original plan was that relatives in USA should write about the last 36 years of Christina´s life in Wisconsin. This book is tranlated into English and be found under the tab CHRISTINA.